The AJAX Login Modals (ALM) plugin extension adds 2 additional triggers to Popup Maker; Force Login, and Click Blocking. It also integrates with the Click Open trigger to display popups that contain login, registration, or password recovery forms. Popup triggers are added to each ALM popup after the plugin forms are set in the Popup Editor via shortcode. This article describes each of the triggers added or modified by the plugin and their application. After installation of the AJAX Login Modals, you’ll have access to this trigger. 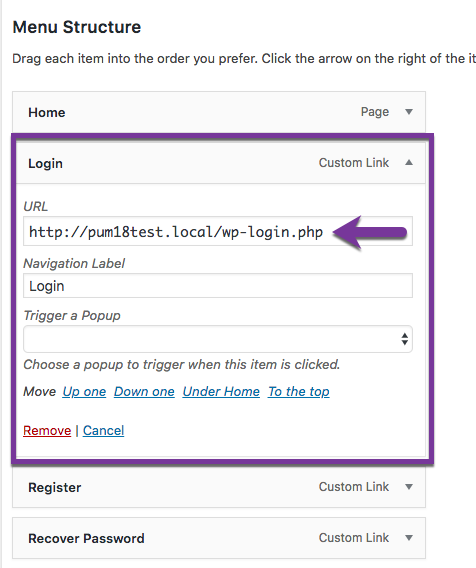 This trigger will automatically open your login popup when a user arrives on your whole site, or specified page(s)/post(s). The Forced Login Trigger forces users to login before they can proceed to the site content, therefore the close button will be disabled and removed. Popup Pro Tip: Display a login popup on a specific page or post with targeting conditions. See the related article below for details. Popup Pro Tip #2: Want to keep your site and content secure at all times? Make sure your users are always logged out with the Secure Idle User Logout extension for Popup Maker. Upon installing the AJAX Login Modals Extension, this trigger will be added to your trigger list. The Click Blocking Trigger functions the exact same way as our Click Open Trigger, including the five available methods to trigger the popup. The only difference is that when a user clicks the targeted element, they will be presented with a login popup, instead of a content-based popup. Once logged in, the user will be forwarded to the action the link is attached to, whether a file download, hyperlink, etc. The visitor has the option of logging in, registering, recovering their password, or closing the popup. The close button remains visible and usable in a login popup. The user won’t be able to access the site content behind the popup without logging in. Popup Pro Tip: Make sure to set a cookie on Login/Registration Successful so your users aren’t continuously spammed by your Click Blocking popup! The Click Open trigger is one of the two default triggers included with the free version of Popup Maker. The ALM plugin extends the Click Open trigger to easily display AJAX-enabled popups for site login, registration, and password recovery. When selected, each of the checkboxes in the Click Trigger Settings box targets a login, registration, or password recovery link to display an AJAX-enabled popup instead. Targeted links are typically located in a navigation menu, sidebar, or footer area, and follow a URL pattern defined by WordPress. For example, when the checkbox above labeled Login is selected, every link that contains the Login URL pattern will automatically trigger an ALM Login popup. No additional triggers are required. In the screenshot above, a custom navigation link named Login is added to a site menu. 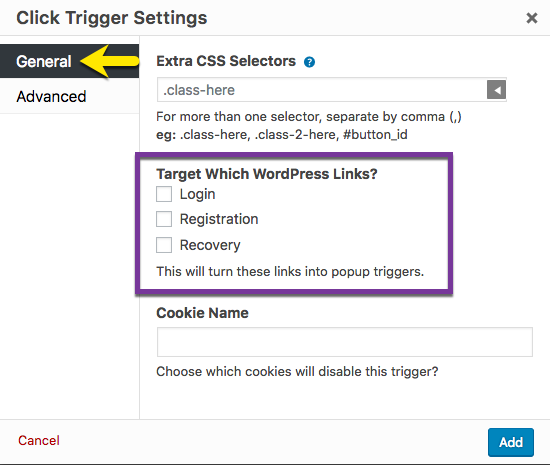 When the Login link is targeted by a Click Open trigger, the navigation link will display a popup on click instead of the default WordPress login page. ALM also works seamlessly with the User Menus plugin to add Login and Logout elements to site navigation menus. The plugin allows users to dynamically change the visibility of navigation menu items depending on a visitor's login status.